An affordable world tour, just a 2-hour drive from Seattle! 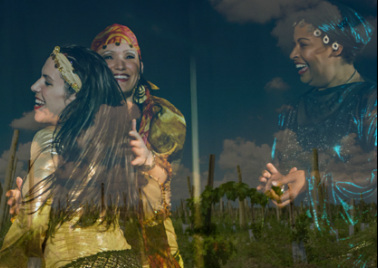 Escape to a weekend of world dance workshops, live music, and wine tasting under the cheery blue skies of Yakima Valley. Play in a sandbox of styles from India, Latin America, Africa, and the Middle East. Taste local Washington wines and connect with local vineyards. Dance under the sunset. Meet other active and open-minded people like you. It’s the perfect getaway and without the plane ticket! Workshops will be held throughout the weekend with a Saturday evening live music jam hosted by Kana Winery on a scenic art patio in downtown Yakima. All workshops will be held at Mighty Tieton's Harvest Hall, a scenic 30-minute drive from downtown Yakima. The Saturday evening concert will take place in downtown Yakima. The hotels below are offering special rates to World Dance Retreat guests, and are in downtown unless otherwise noted. Reservations must be booked directed with them, and paid separate from retreat/workshop registration. Be sure to mention booking at the rate quoted for World Dance Retreat. All rates are subject to tax. As there may be other events in Yakima on this weekend, please book immediately to secure your accommodations.